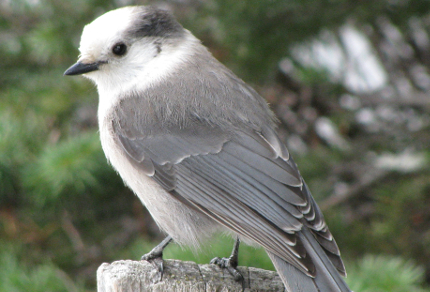 Fluffy and friendly, the handsome grey jay is the voice of North America’s vast coniferous boreal and subalpine forests and has an amazing memory. Also called the Canada jay, the grey jay is a songbird (passerine) that belongs to the avian family Corvidae, which includes jays, magpies, crows and ravens. 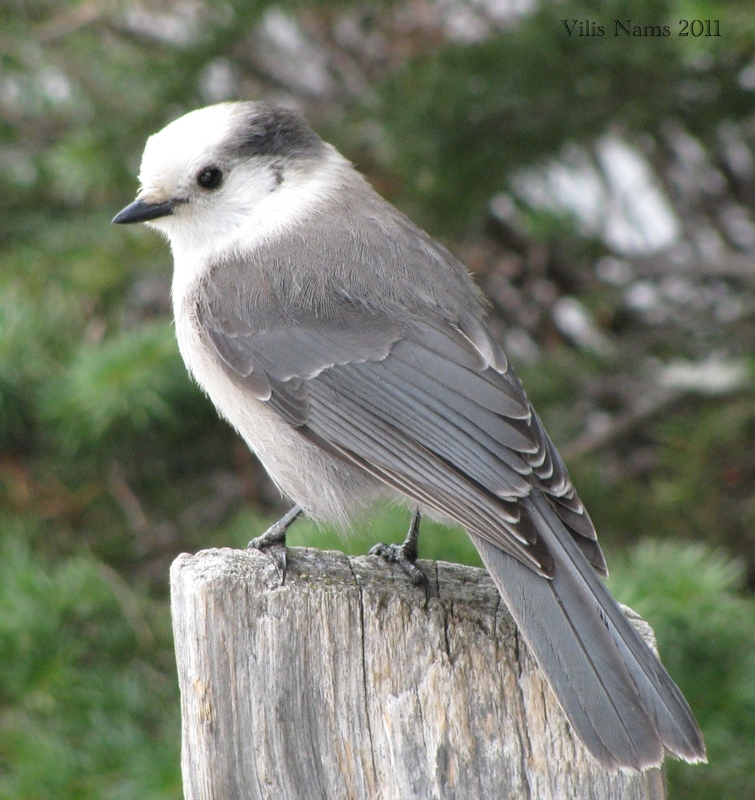 Grey jays are hardy denizens of harsh environments, living year-round in coniferous forests to tree line. Their typical foods include ticks and insects, small mammals, bird nestlings, carrion, fungi, berries and seeds. In winter, they subsist on thousands of items of food they laboriously cache during the summer, when they hide sticky boluses of food among tree needles or under bits of bark or lichen.2 And for all of you who hate to memorize anything: the grey jays memorize exactly where they cache every bit of food and find their supplies months later, purely from memory. Curious and opportunistic, grey jays visit human habitations and camps, earning the nickname of “camp robber.” Another nickname, “whisky jack,” is the anglicized form of Wisakedjak, a First Nations’ mythological figure, with whom the grey jay is associated.3 The photos featured here are of an accommodating grey jay that popped out of the forest at Lake Louise in Banff National Park and hung around for several minutes, giving Vilis the opportunity to photograph it. I first encountered grey jays while working as a paleontologist’s field assistant in the foothills of the Rockies. I became better acquainted with this species when I spent a summer working as a mammologist’s field assistant in the Northwest Territories. 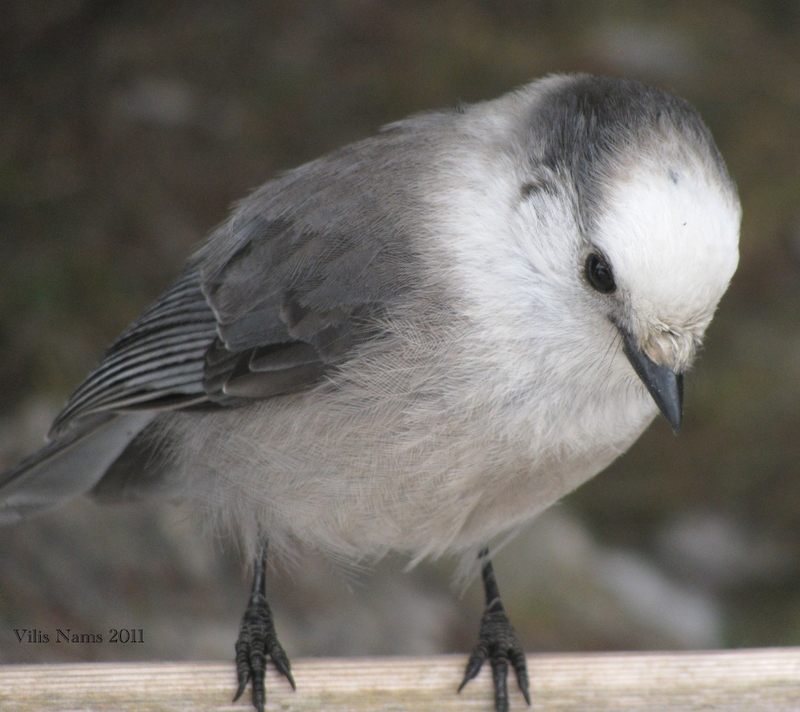 Then I became a birder, and three years of life on a research base in the Yukon Territory gave me plenty of opportunities to get to know grey jays. I learned to recognize their musical notes and strident “cha-cha-cha” calls. I became quick to discern their field marks (grey back, wings and tail; white head marked with dark grey; pale grey belly; white tail feather tips; small, dark beak; dark eyes and feet) and flight pattern (steady wing beats, glides through the forest). I discovered that the mysterious soot-coloured birds hanging around the base were, in fact, juvenile grey jays that look markedly different from adults. Here in northern Nova Scotia, grey jays are an uncommon sight, although our local Tatamagouche Christmas Bird Count usually records a few and I have occasionally seen grey jays on our property. The handsome grey jay recently received the honour of winning the Royal Geographic Society of Canada’s nomination as the national bird of Canada. Grey jays mate for life and begin nesting in February or March, while the North is still in the depths of winter.2 That means these cute but tough birds might be starting to build their nests right about now. 2. Cited in Wikipedia: Strickland, Dan; Ouellet, Henri. (1993). Grey Jay. In: Poole, A.; Stettenheim, P.; Gill, F., eds. Birds of North America, No. 40. Philadelphia, PA: The Academy of Natural Sciences; Washington, DC: The American Ornithologists’ Union. Exploring Faith: Who Am I to Receive a Gift of Such Beauty? Spiritual Renovation: Are We Worth Saving? © 2010-2019 Magi Nams. All Rights Reserved.